It’s a pile of rocks at the top of a hill, a nice walk on a sunny Spring afternoon. 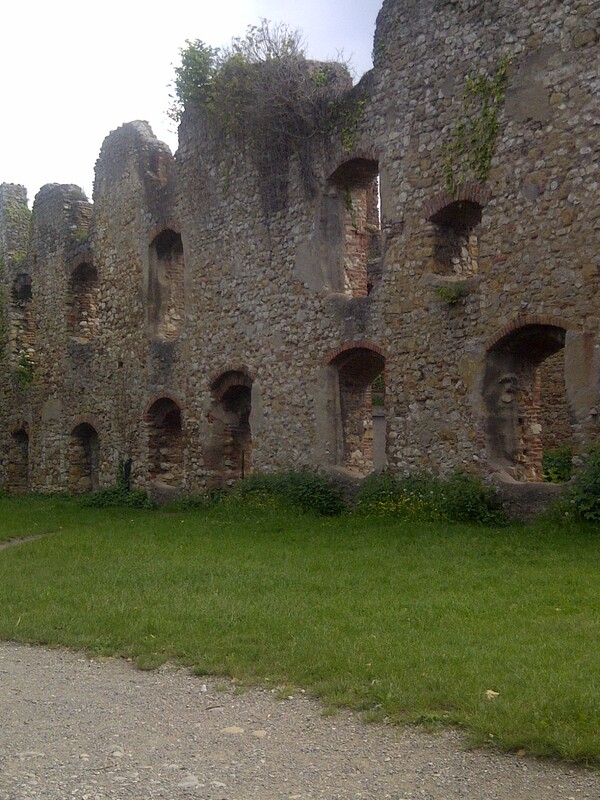 At one time the castle at Staufen im Breisgau was a pretty big deal. Now it is just pretty. The castle was built initially in 850 (on a site where the Romans had had a watchtower centuries before) and torched in 1634, during the Thirty Years War. If you don’t remember what that war as all about, that means you’re not a European. (It was a particularly nasty conflict, which is usually the case when you mix politics and religion.) I must confess that from the ruins I really couldn’t get much of a sense of what the place was like when it was inhabited. 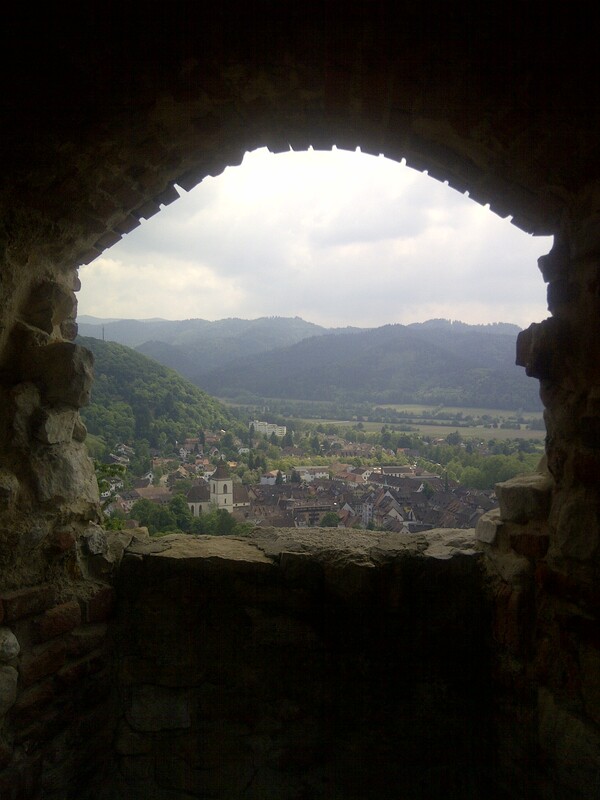 But I did get some nice views of the area; the castle has a commanding view of the region. The village of Staufen is in a wine producing region. 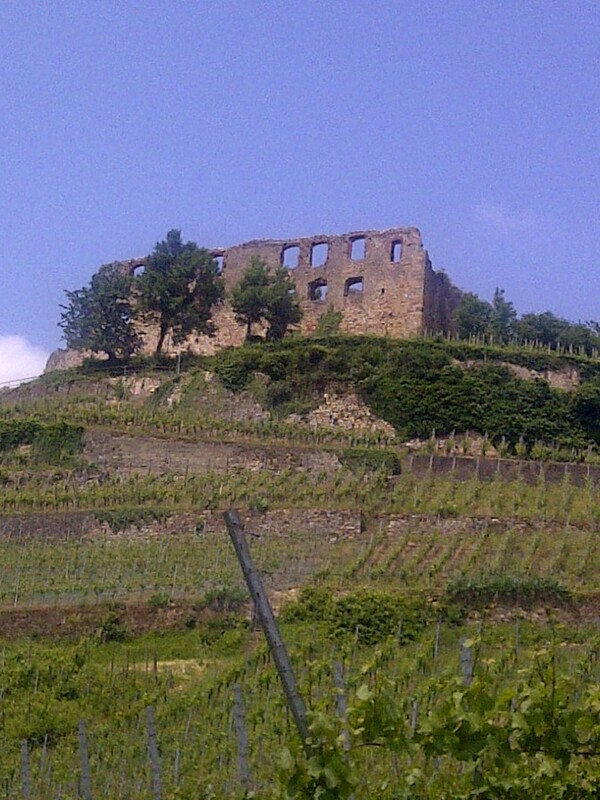 The castle sits atop a hill covered in grapevines, eight different varieties, or so I was told. If I had been thinking straight I would have asked more about the local wine production, just to see if I recognized any of the area’s products. Probably wouldn’t have made a difference though – I will never be considered an oenophile. I know that wine is made from fermented grapes and is usually white or red. Beyond that my knowledge fades. The castle ruins aren’t spectacular, but they are popular. On a Thursday afternoon I note a steady stream of people coming up the hill to look around. There is a gently sloped paved pathway or a steeper climb through the vineyard. We took the easier route. I have after all just gotten off a plane. The idea is to keep me busy then let me crash when evening arrives. The idea is that doing this will help me get over jet lag faster. All I know for sure is that my body thinks it is 9 a.m. and I have been up all night. (I do so envy those who can sleep on planes.) According to the sun it is mid-afternoon, so I have at least another six hours to stay up. There’s not much in the ruins by way of explanation, and what is there is only available in German, a language I don’t speak. I have no idea what each of the rooms were used for, not that there are many rooms left. Mostly just the shell of the building. I guess this area doesn’t cater much to us Anglophones; I am told it is a very popular tourist destination for the Swiss and Germans. From subsequent web surfing I will learn that the courtyard could hold up to 1,000 people – the villagers would take refuge here during times of conflict. Times have changed, as has our need for such civic structures. Or maybe it is that our “villages” have grown so large that there is nowhere for the people to go in times of need. I guess that means were are on our own should our region be threatened by war. Not that a castle would be much protection against modern weaponry. Still though, I seem to remember that when Hurricane Katrina wiped out a good portion of New Orleans, in 2005, it was the modern equivalent of a castle, a football stadium, which was used to house those fleeing the storm’s impact. The Louisiana Superdome is much bigger than Staufen Castle – 26,000 people took refuge there to escape from the storm. However I doubt that tourists will be exploring the ruins of the Superdome a few centuries from now. We don’t build them like we used to.